Property in Houston reached record heights in June, confirming the city’s potential as one of the hotspots for US property this year. Monthly sales were the best ever and median prices reached a historic high, ahead even of those registered in 2014 a record year in itself. In its annual property predictions published at the beginning of this year, Forbes’ Where to invest in 2015 ranked Houston in third place nationally. Forbes pinpointed the Texan city for its growth in both population and employment. Despite volatile oil prices and the fear that these would affect the city’s economy, the Houston property market is easily fulfilling Forbes’ expectations. 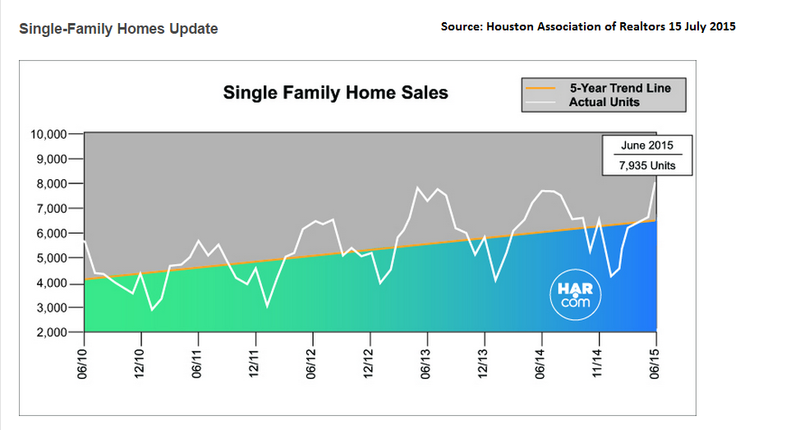 Sales of single family homes in Houston in June grew by 4.1 per cent to reach a total of 7,935, the highest ever in a single month in the years of data-collection by Houston Associated Realtors (HAR). Median prices topped their 2014 record and stood at US$225,000 last month, a 4.9 per cent on those registered a year earlier. As well as achieving high sales, single family homes are spending less time on the market. The average time taken to sell this type of property in Houston averaged 43 days in June, down from 47 days a year ago. Inventory levels have picked up slightly and now stand at 3.2 months compared to 2.9 months in June 2014, but still lie considerably below the national average of 5.1 months. Alongside high property sales, Houston rentals also continue to enjoy a bullish 2015. According to HAR statistics for June, the demand for single family home rentals in the city grew by 4.6 per cent in the month while rental rates increased by 4.2 per cent to reach US$1,875 a month. Unsurprisingly, Houston real estate agents were ecstatic about June figures. HAR Chair Nancy Furst claimed the data reflects the health of the Houston property market, particularly when it is compared to the record year of 2014. “We still expect normalisation in the marketplace later this year, but the bottom line appears to be that there is no lack of interest in housing in Houston,” she told a press conference. The editor of Realty News Report Ralph Bivins wrote that “the momentum in Houston could last for a while” because he sees no sign of a slowdown despite the fall in oil prices. He predicts that 2015 will be one of the strongest years for Houston property ever and possibly the best. Interest in the Houston market comes principally from Americans moving to the city to take up employment opportunities. One of the city’s largest relocation companies John Daugherty Realtors report that their business rose by 24 per cent in the first six months of this year. “We’re seeing a tremendous amount of movement of people coming into Houston,” said Mr Daugherty, quoted in the Houston Business Journal. He also pointed out that Houston features strongly among foreign buyer preferences too and across the board when it comes to property type. Two of Houston’s most expensive properties priced at over US$10 million were sold to foreign buyers last year. “Worldwide, there’s just so much interest in this city,” Mr Daugherty said.